The iPad units numbers were not a surprise (except perhaps to some of the professional analysts who do not read Apple’s press releases). Among the more accurate (amateur) analysts, the range was from 3.2 to 3.45 million with an average of 3.32. My estimate of 3.3 million was the mode of the distribution. Apple sold 3.270 million in the first ever quarter. The ASP came in at $662.39, below my expected $700 but higher than the iPhone. The only unknown is the gross margin. Given the overall GM and the other products’ margins, I am backing out a 33% margin for the quarter. I had expected 40% but the lower margin may be a result of launch quarter issues (shipping and allocation of stock) and perhaps a lower target margin for the product. 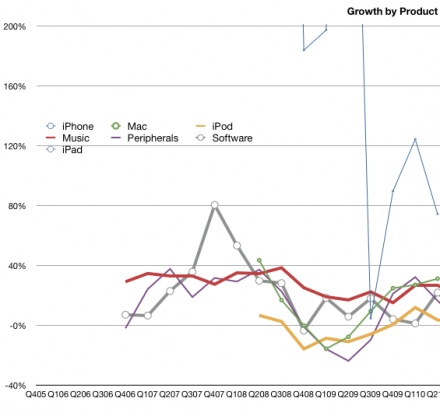 It should be noted that the iPad margin sits between the Mac and iPod (around 30%) and the iPhone (around 60%). The iPad is a new category that sits between the Mac and iPhone in terms of usage and it seems it sits also half-way in terms of margins. Going forward, I’m still modeling a 40% GM for the iPad. 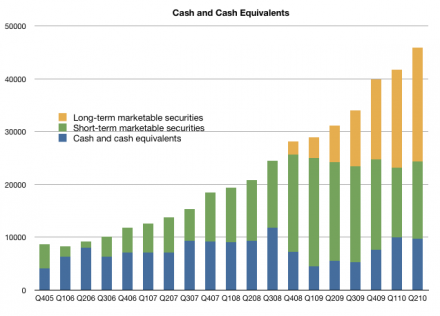 Overall, I estimate the iPad added $717 million of operating profit to Apple’s bottom line. Not bad for a product that was almost universally panned on launch day. Calling the iPhone this quarter was going to be a challenge. This was a transition quarter where an old lead model would be replaced with a new one. The launch of the iPhone 4 was going to affect the volumes, but nobody could predict how. We’ve had a few such quarters and they were volatile. The number of sales days varied and the distribution of the old product was much different. The problem was compounded by the leak of the prototype and the uncertainties of launch day logistics. My forecast had been 8.5 million units. In the event, 8,398,000 iPhones were sold. This included 1.7 million iPhone 4s which means about 6.7 million 3GS phones sold. That’s quite remarkable given the end-of-cycle timing. 8.7 million 3GS were sold in Q2 which means the sell-in was down only about 2 million for the transition. The even more remarkable story is the average selling price. It came in at $635.15. 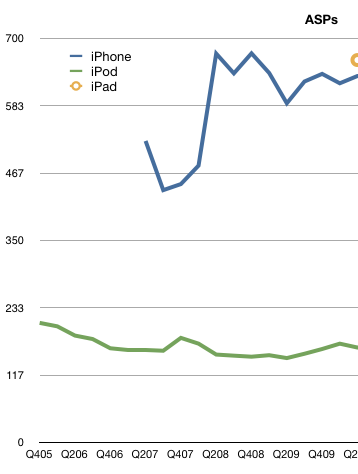 The iPhone has ranged from $437 to $674 ASP over the last three years (see chart). This figure places it near the top of the range, a great performance for the end of a product cycle quarter. I estimate gross margin at 56%, a drop from the more typical 60% due to iPhone 4 launch. With revenues of $5.33 billion and cost of sales of $2.2 billion, Apple created operating profit of $3.13 billion–we’ll take a look at that number relative to other vendors later. Growth year-on-year were 74% for revenues and 61% on units. For a transition quarter, these numbers are spectacular. For comparison, during 2009’s transition quarter (Q4) revenues grew at 5% and units 7%. Furthermore, according to Apple’s management, iPhone unit sales in the June quarter were running 90% above the year-ago period prior to the company draining thechannel ahead of the iPhone 4’s release. In the December and March quarters, unit sales were 100% or more above prior-year results. This means that 100% growth is sustainable though going forward I’m keeping forecast at 65% growth. Seventy percent revenue growth cannot be seen as anything other than a sign of rude health.